Like other businesses, sports companies too need an aggressive marketing for successful business operation. But your new sports business first needs a perfect name. Potential customers get a sense of what you do as a company from its name. A catchy, simple, and unique name can even give your business identity. The business of selling sports items, or providing services such as coaching, has the potential to grow fast. Many sports business opportunities are waiting for your attention. You have already one such sector of sports in mind and rearing to take on the market. But what’s about your sports company’s name? Have you already chosen one or still to decided? If not, then make sure that the name is a perfect choice. Note that all the successful businesses have great names that clicked with the audiences. Your potential customers of new sports company will get your brand message from the company name. The name will tell them about the market niche of your company. But naming a company is never easy. However, the naming of a business is a difficult task. You have to through a naming process. Researching your niche, knowing the competitors, checking its availability as a trademark and other steps are essential to choosing a name for your company. You have to consider many aspects of a business before picking the right name. Your sport company should have a unique name to drive potential customers’ attention. 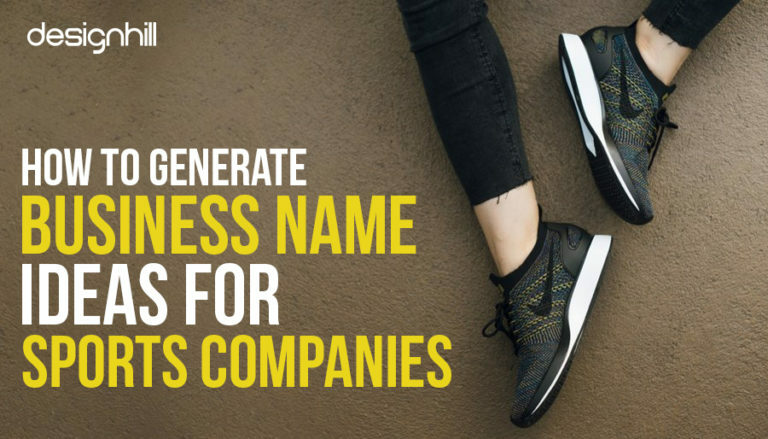 These business name ideas can help you pick the right one for your new sports company. Your target audience will like the name if it is simple and unique. If the name has difficult words and sounds, the customers will be unable to pronounce it easily. Because of this, they may not take your business seriously. Your sports business logo design, which is the face of your company, will also look impressive with a simple company name in it. Sports companies grow with time. You can too add more sports products or services after a few years, and can also enter new markets. So, choose a name that still looks relevant and covers your new market, products or services when you expand. Remember, with such a name you do not have to recreate your company logo design when you enter into the new markets and services. Do some research on the web about what names other sports companies have. You can have an idea about the type of name your company should have. You should especially research your sports niche. You can also know the names that will stand out. For example, if naming a sports team is the need, research the web for various such team names and see how yours name looks different. Moreover, your sports team logos will also look great and unique with such a name. Usually, a .com domain name is what businesses prefer over the others such as as.net, .org, and .biz. But what if .com is not accessible as someone has already booked a name similar to your company name as a domain? Do not worry. You can add or subtract some characters or letters to create a slight variation of the name and see if you can book it as a domain. Check the domain availability on sites like GoDaddy.com or NetworkSolutions.com. Your domain name matters for launching your sports business on the web. So, before you create sports team logos or a website, get a perfect domain name. The name you select should convey some meaning related to your sports business. A meaningful name matters much for the new sports company. The potential customers or clients can quickly pick the field of your business just by your name. Also, the name will appear in your custom sport logo design. That is also an advantage as the name itself becomes a marketing tool. Now that you have found a suitable name, think of registering it as your trademark of sports business. A trademark registration will protect your business and company from any infringement by your rivals. No one can use your company name after the authority gives it to you as a trademark. So, visit the site USPTO.govt to check if the name is available for trademark registration. If it is not, then think of the other name from your shortlist. Also, your logo designer will incorporate the name in your company logo, which makes the trademark even more critical. People sometimes like catchy names just for fun. New sports companies can build a customer base if it’s likes by the target audience. You can create such names by playing with words. You can create one such name by twisting a trending word. When you create a logo for your sports business, a unique but catchy business name will look great on the logo. Once you have finalizes three to four names, find out what people have to say about them. People’s opinion matters as they are the customers of your sports items or services. Their perception about your business is the key to its growth. So, get feedbacks from everyone including, your family members, neighbors, and friends. You can even consult your professional graphic designer to know how the name will look on different platforms such as website, logo, business cards, etc. Sit with your company’s team members and others for some brainstorming sessions. You should ask them to suggest appropriate names that are relevant to your company and business. These sessions will help you short list few names. You can also take help of some name generator software on the web to get a list of the sports company names. Discuss the pros and cons of those names. You should also find out how the names will look at graphic designs such as logos, websites, brochures, mobile apps, etc. that you need to promote your new business. Any name that you choose should look pleasing and appealing to you as the owner of your sports company. If you have doubts and you do not like the name then think of the other name from the list. After all, the name must give you the much-needed confidence to run a business. It should energize you to carry out your duties day in and day out. Do not forget that the name is your brand identity as well. You need the name also as your social handle. So, your sports company name should be available as a username for different social channels including Facebook and Twitter. You will be taking your business to your potential customers on many social platforms using the name as your social handle. Therefore, check if the name is available for use as a handle for your social media page or not. These are the key considerations when you want to name your sports business. But the process takes time to yield the results. You may need to go through more brainstorming sessions. Therefore, patience is the key to settling for a perfect name. After you have picked the right name, take all the necessary steps for brand promotion. You will also need logos, websites, mobile apps, brochures, business cards, and many other identities. You can avail such design solutions at affordable prices from Designhill, a leading marketplace. New sports companies should have appropriate names that can spell out their core business. A simple and unique name is the key, but it should also be your domain name and registered trademark. Go through several brainstorming session to come out with the names that stand out in your niche market.